For rack and pinion railways, see Rack railway. A rack and pinion is a type of linear actuator that comprises a circular gear (the pinion) engaging a linear gear (the rack), which operate to translate rotational motion into linear motion. Driving the pinion into rotation causes the rack to be driven linearly. Driving the rack linearly will cause the pinion to be driven into a rotation. For example, in a rack railway, the rotation of a pinion mounted on a locomotive or a railcar engages a rack between the rails and forces a train up a steep slope. For every pair of conjugate involute profile, there is a basic rack. This basic rack is the profile of the conjugate gear of infinite pitch radius (i.e. a toothed straight edge). Rack and pinion combinations are often used as part of a simple linear actuator, where the rotation of a shaft powered by hand or by a motor is converted to linear motion. The rack carries the full load of the actuator directly and so the driving pinion is usually small, so that the gear ratio reduces the torque required. This force, thus torque, may still be substantial and so it is common for there to be a reduction gear immediately before this by either a gear or worm gear reduction. Rack gears have a higher ratio, thus require a greater driving torque, than screw actuators. Most stairlifts today operate using the rack and pinion system. A rack and pinion is commonly found in the steering mechanism of cars or other wheeled, steered vehicles. Rack and pinion provides less mechanical advantage than other mechanisms such as recirculating ball, but less backlash and greater feedback, or steering "feel". The mechanism may be power-assisted, usually by hydraulic or electrical means. The use of a variable rack (still using a normal pinion) was invented by Arthur Ernest Bishop in the 1970s, so as to improve vehicle response and steering "feel," especially at high speeds. He also created a low cost press forging process to manufacture the racks, eliminating the need to machine the gear teeth. Wikimedia Commons has media related to Rack and pinion steering. Rack railways are mountain railways that use a rack built into the center of the track and a pinion on their locomotives. This allows them to work on steep gradients, up to 45 degrees, as opposed to conventional railways which rely on friction alone for locomotion. Additionally, the rack and pinion addition provides these trains with controlled brakes, and reduces the effects of snow or ice on the rails. Wikimedia Commons has media related to Rack and pinion (railway). A rack and pinion with two racks and one pinion is used in actuators. An example is pneumatic rack and pinion actuators that can be used to control valves in pipeline transport. The actuators in the picture on the right are used to control the valves of large water pipeline. In the top actuator, a gray control signal line can be seen connecting to a solenoid valve (the small black box attached to the back of the top actuator), which is used as the pilot for the actuator. The solenoid valve controls the air pressure coming from the input air line (the small green tube). The output air from the solenoid valve is fed to the chamber in the middle of the actuator, increasing the pressure. The pressure in the actuator's chamber pushes the pistons away. While the pistons are moving apart from each other, the attached racks are also moved along the pistons in the opposite directions of the two racks. The two racks are meshed to a pinion at the direct opposite teeth of the pinion. When the two racks move, the pinion is turned, causing the attached main valve of the water pipe to turn. Wikimedia Commons has media related to Rack gears. ^ a b Gear Nomenclature, Definition of Terms with Symbols. American Gear Manufacturers Association. p. 72. ISBN 1-55589-846-7. OCLC 65562739. ANSI/AGMA 1012-G05. 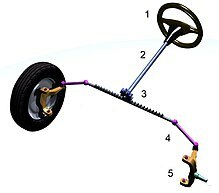 ^ "Rack and pinion variable ratio steering gear". Google Patent Search. Retrieved 2007-03-22. ^ "Automax SuperNova Series Pneumatic Rack & Pinion Actuators" (PDF). Flowserve Corporation. Retrieved 7 July 2014. ^ Phillips, Jack (2003). General Spatial Involute Gearing. Berlin, Heidelberg: Springer Berlin Heidelberg. ISBN 3662053020.